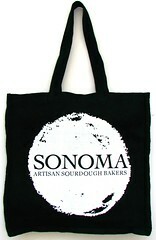 Printing your brand on a Reusable Bag is fantastic & cheap advertising for your business. But if you're not careful, it can get expensive - especially printing. The experts at Bag People can guide you through the process & make sure you get great exposure at the lowest price. Simple screen print is one of the oldest & most trusted ways of printing + it's the cheapest. To the right is an example of a 1 colour screen print on a Black Bag that delivers an outstanding & impactful result. When buying Reusable Bags from Bag People you can get additional print colours for just a few extra pennies. What do you think we can do with your brand?